Nearly due west from this on a low shale ridge, called Knockacarn, in line with Lismoher, is a row of sites. The first two, in Ballyhomulta, are an earthen liss called Liskeentha (Lis caointhe). I was told at Noughaval, in 1908, that its name was derived from ‘fairy songs’ which had even been heard ‘not long before.’ West from it, on top of the ridge (465 feet high), where the townland meets those of Rusheen and Kiltennan, are another liss, a smaller one in Kiltennan and the cairn which gives the ridge its name. If we extend the line, it meets in the next townland another alleged fort site, where the Castle of Roughan probably stood. The tradition of the last was rather vague as to its being a castle. Beyond this, save Drimneen fort in Ballykeel and a larger ring mound in Knockavoarheen, no early remains or medieval ruins occur for over two miles, till we reach Cahermakerrila to the north-west. The linear arrangement of forts, not uncommon in Ireland, is well marked at Noughaval; besides the five in line from Lismoher we see the great line west-north-west and east-south-east from Caherkyletaan (past Cahercottine, Caherwalsh, a ring fort, Cahernaspeekee, a slab enclosure and souterrain, the square bawn, the ring wall and castle) to the great dolmen on Ballyganner Hill. A third line at right angles to the last, passes (through a Cathair, the square bawn, Ballykinvarga, and a levelled fort) towards the great hill fort of Doon. The cause of this linear arrangement is unknown; some explain it as originating in a long ridge, but this is certainly not the case at Ballyganner. The two main lines evidently took as their goals the high standing dolmen and Doon fort, but no such prominent object fixed the line over Knockacarn. This doubtfully named stone fort  1 has suffered horribly since 1895 by rabbit hunters and perhaps treasure seekers. The fine slabbed terrace is entirely defaced; the slabs were set upright along the face of the wall like a veneer. The gate has been cleared out by some treasure seekers and the jambs destroyed. The lintel lies across it and is intact, but is only 4 feet 6 inches long, so the ope was probably very narrow, hardly 3 feet wide; the gate faced south. Only a portion of the rampart to the south-west is still 6 feet high, as most of the ring was on my first visit. The masonry is good, but open joined, and I think far later than the finely fitted work at Cahercuttine, Caheraneden, Caherminaun and Ballykinvarga. Between this fort and the bawn to the south is a long grassy depression artificially cleared, and shaped, perhaps, the faitche or green. The early laws  (Book of Aicill) provide for the upkeep of such ‘greens.’ To the west is a house site of large slabs set on edge; it is about 21 feet across, east and west, by 18 feet wide. The north wall is double, and in the north-east corner is a small souterrain under a large slab. The whole resembles the site in Knockauns fort near Tullycommaun. The baun is now quite defaced and overgrown. There are three cairns or mounds of earth and stone slabs; two to the north of Cahernaspeekee, quite perfect; another to the south, with remains of a small slab cist; they vary from 5 feet to over 8 feet high. There are some regular oval green mounds, rarely 2 feet high, on the crag. One about 4 feet high has a set slab, evidently once a cist. There is a fine well in the valley to the south of these, half way between the Castle Cathair and Cahernabihoonach. Due north from it are the fallen dolmen, the long rock-cut road from the latter to Caheraneden and the slab hut. The group of ruins farther eastward, besides Cahernabihoonach, includes the ‘cairn caher’ with its outer enclosure and perfect gateway  and a large bawn (near a curiously split and very conspicuous rock) which I think is almost certainly the ‘Mohernacloughbristy’ named along with Ballyganner in a deed of 1712. Besides the eastern one, probably from Caheraneden to the well, but not traced by me south from the fallen dolmen, there is another well- marked road, with at least two side, or cross, roads at right angles to it. They were formed, like the Creevagh avenue, near Glencurraun, by removing the water-fretted upper layer or layers of the crag. One runs nearly north and south from the direction of the great dolmen on the hill towards the cairns to the north of Cahernaspeekee and close to the east of the cairn near the bawn. When we get opposite to the pillared dolmen, a line but little to the north of Caheraneden, we see another road running to a little hut-ring close to the dolmen. I think there are traces of another road crossing this about half way between the main road and the hut parallel to the first. Yet another important road runs east and west (along the map line of the townland name, ‘Ballyganner North’) not far to the north of Caherna-speekee. I incline to attribute these works to the dolmen builders, who were accustomed to raise and transport large slabs, for the ‘Caheraneden road’ runs truly along a line through the great dolmen and the fallen dolmen (Caheraneden and the northern cathair on the ridge, being on its axis), while the first cross-road runs due east and west towards the pillared dolmen. The site is so rich and remarkable that I hope some other antiquary may study it as a whole to some sound conclusion. Hard and painful as is the work done on fissured crags, hidden in grass and moss, I would urge others to work it out. I give what I can, but a complete plan of a settlement occupied from the bronze age to the later 17th century with graves, residences, wells and roads should be worth obtaining, and it is possible that other roads and foundations may remain, especially to the east of the tract explored for this survey. I have been able to clear away the deep moss and debris and to plan this complicated monument in its entirety. The harp-shaped annexe to the north was entirely concealed in moss, bushes and debris till now. 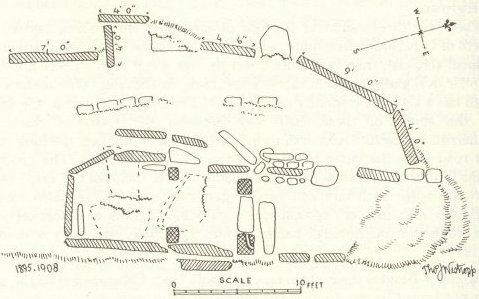 There are two slab huts, possibly late, a short distance to the north of Cahernabihoonach. I do not attempt to date the slab enclosures. The fences round such dolmens as that at Iskancullin are probably contemporary with the monument, so, possibly, are the circular slab rings, which are probably the basement of wooden and clay huts. On the other hand, the rectangular hut sites are probably far later, and the slab fences, such as we find at Leanna, still more recent. The same may be true of the cairns. In 1681, Thomas Dineley  notes of Burren that ‘the particons are made of broad stones like slate turned up edgeways,’ and in 1752 Dr. Pococke writes of Achill, Co. Mayo, that the people ‘have a custom of raising heaps of stones, here called laktch (leachta), in other parts kerns (carns) to the memory of the dead.’ The custom has yet not died out in Aran and North Connacht. The late huts of beehive shape, with corbelled roofs (found in Aran and some in Co. Kerry, on the Blasket Sound, so late that I saw one in the course of building near Dunquin in 1904), are also a serious warning against confident dating. As a rule, however, primitive work is of far larger materials than its late descendants. Here I may warn against another error alleging old remains to be modern on insufficient authority. The ‘oft told tale’ of the British Association  is as a rule ‘left half told.’ The visitors in 1857 were informed that a supposed early hut had been built a year or so before, but the rest of the story is always garbled or suppressed by would-be jesters, for the hut was found marked as ancient in the maps of twenty years earlier, and the scoffer was proved a liar - as often happens. This shows how little any statement made by a native should be received, especially when made to a pic-nic party of strangers. Professor Macalister was told by an old man that certain huts in the Fahan Group were modern, but the mendacious peasant was forced to confess the contrary by other natives present. I had very rarely had cause to doubt information, save on the tourist tracks, or when tourists were by; it is always easy to test local belief by finding an informant not present on the first occasion. The ‘educated classes’ in Co. Clare, if not elsewhere, are rarely found to give any particulars of value or even of trustworthiness.